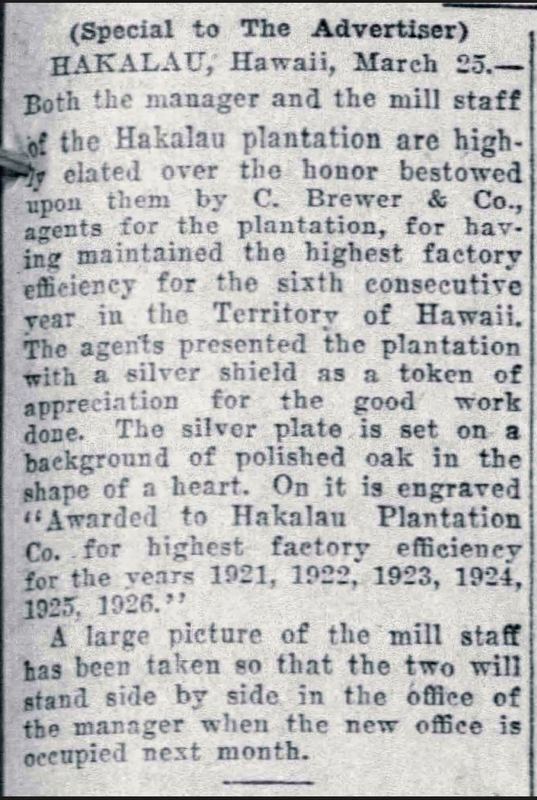 Included in this detailed timeline of the 1920s are excerpts from the annual reports sent to C. Brewer by John M. Ross, manager, Hakalau Plantation Company. 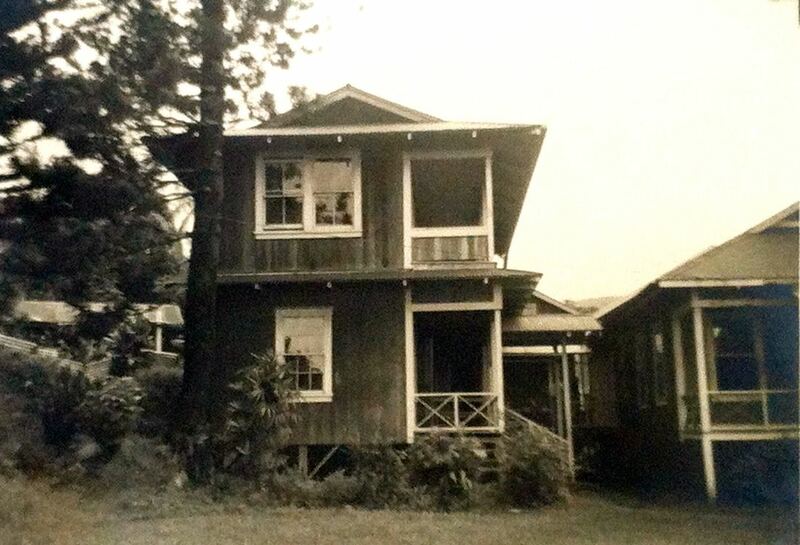 John M. Ross played a prominent roll at Hakalau, serving as head overseer from 1884-1905, manager from 1905-1942. Annual reports provided courtesy of the Edmund Olson Trust Archive. Sanitation: The principal item under this head is the laying of 800 feet of fourteen-inch concrete sewer pipe running from the Hakalau upper camp to the sea bluff. 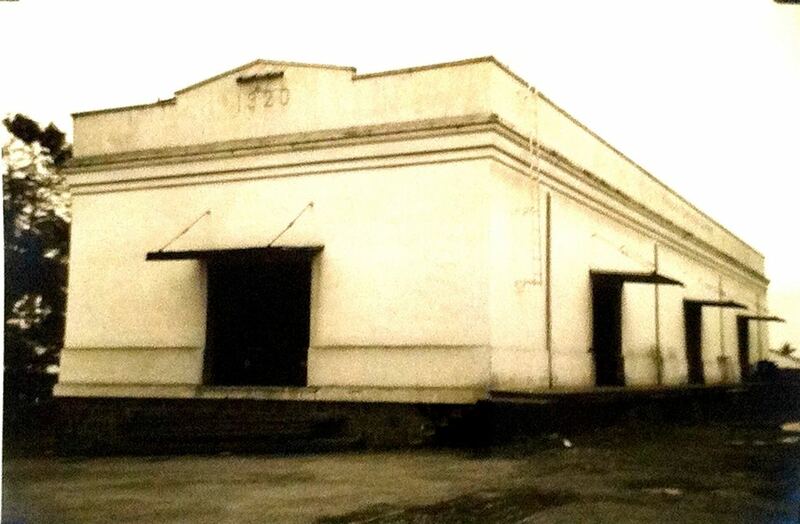 One reinforced concrete General Freight Warehouse. These were necessary on account of changing our method of transporting everything by the Inter-Island Steam Navigation Company’s steamers to that of having our sugar and supplies hauled by rail. Our old landing warehouse is being converted into a stable, the present dilapidated building is to be torn down and its site used as a lumber yard, the present lumber yard site having to give way for a site for the General Freight Warehouse. 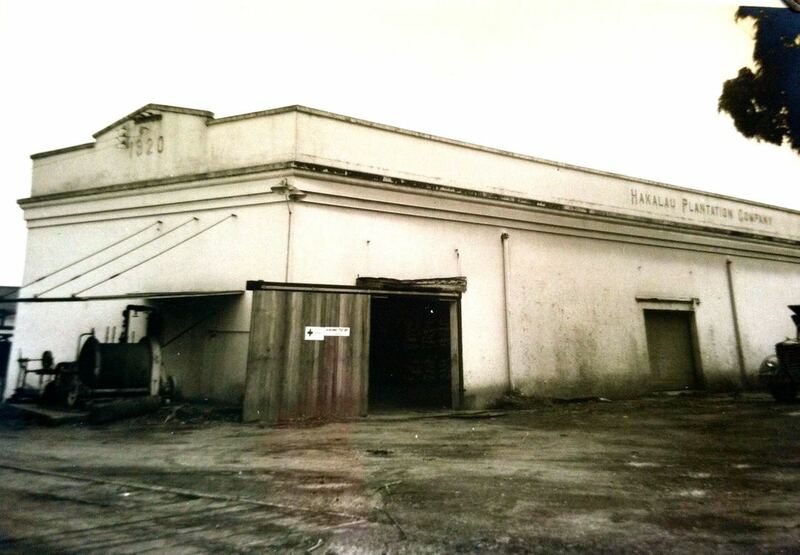 Reinforced Concrete General Freight Warehouse, built 1920. Reinforced Concrete Sugar Warehouse, built 1920. 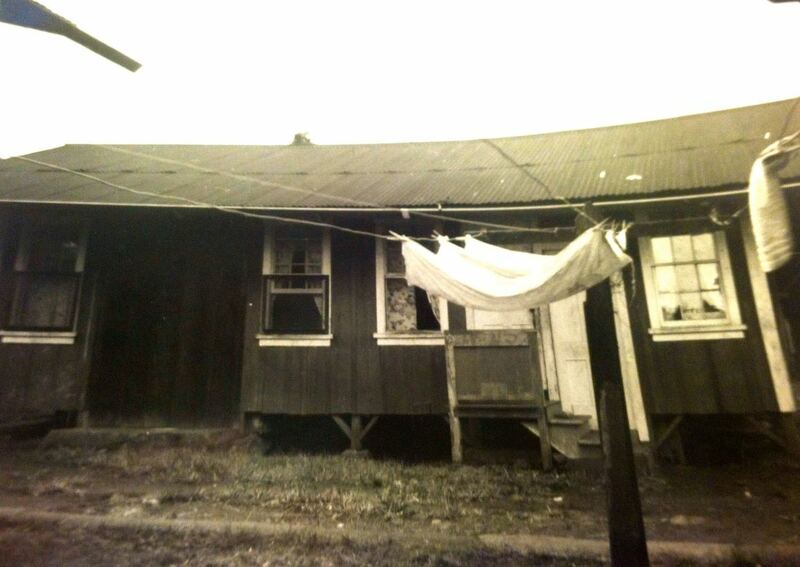 Plantation Buildings: One new laboratory; one new limehouse; one large Japanese house at Chin Chuck Camp, which is used as a single men’s boarding house. ​Conclusion: In the entire depressing situation of the sugar industry we are pleased to report a more settled condition among our laborers, and a better spirit of cooperation and efficiency among them for which we tender them due and grateful recognition. Replacements and Betterments to Mill and Mill Buildings: During the year these have been comparatively light and include the replacing of two rollers, two couplings and two gears (second hand) which we had on hand as spares. These together with the general overhauling of all live and exhaust steam lines, juice lines throughout the house, rebuilding our furnaces and repairs and painting of the building, comprise the major portion of our outlay and leaves your factory in very good shape to take care of the 1923 crop. ​Plantation Buildings: A matter of some $10,000 has been expended for new quarters for our unskilled and semi-skilled laborers, together with much repair work and painting that would be tedious for you to have in detail, but which is all incorporated in the respective accounts. ​Sanitation: Under this head we have done more than for several years. We will not enumerate the different times for they are all found in their respective accounts and approximately total an outlay of $1,200.00. ​Recommendation for Future Improvements: We would recommend that there be spent from $10,000 to $15,000 for housing, $5,000 for sanitation, $2,000 for domestic water supply and approximately $10,000 for caterpillars and trucks. ​Labor: We take this opportunity of bringing to your attention a better spirit of co-operation among our laborers than has been the case the past few years, and which is as creditable and profitable to them as pleasing to us. ​Conclusion:…It is with pleasure we start this year with brighter prospects than we did 1922, and are more than pleased, also thankful that our pessimism of 1922 was a bad guess. 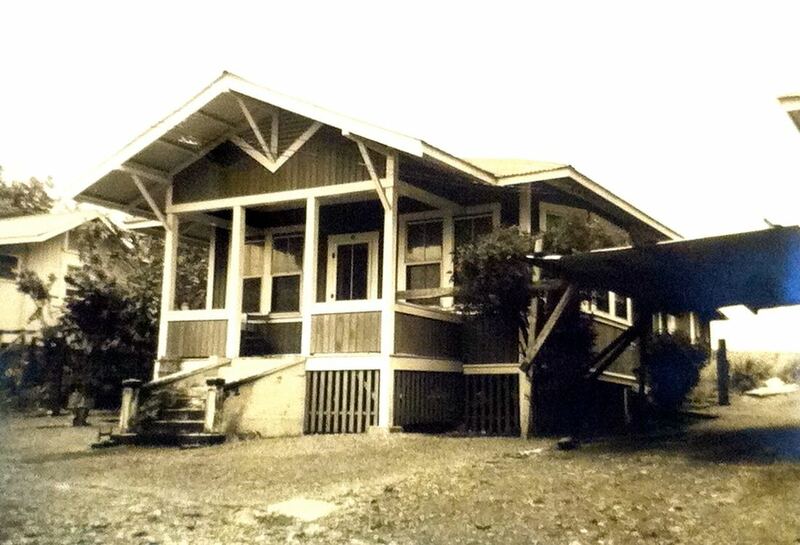 Honohina Upper Camp house #652, built 1922. Chin Chuck Genjiro Camp house #418, built 1922. 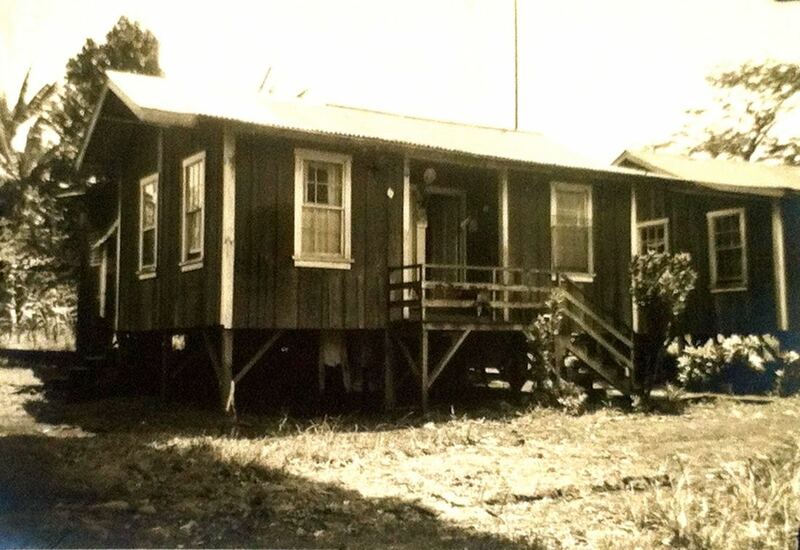 Honohina Lower Camp house #686, built 1921 or 1922? 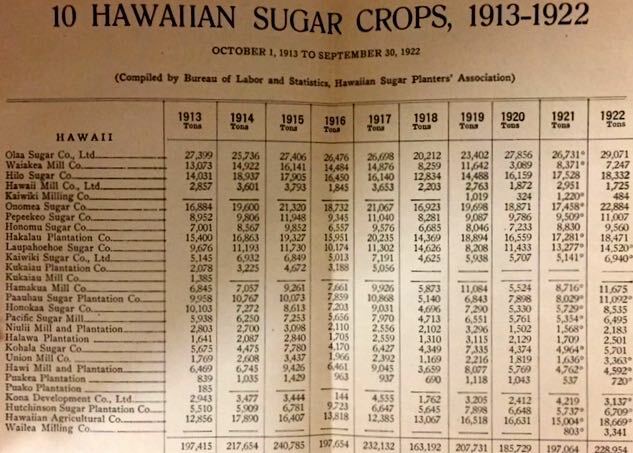 C. Brewer records summarize the sugar crops by plantation from 1913-1922: In the decade 1913-22, Hakalau Plantation was considerably bigger than most others on the Hamakua Coast. Pepeekeo and Honomu were half its size. Based on tons of sugar per annum, it was roughly on a par with Hilo Sugar and only somewhat surpassed by Onomea. As with the other plantations in this period, yearly production varied mainly as a consequence of rainfall. 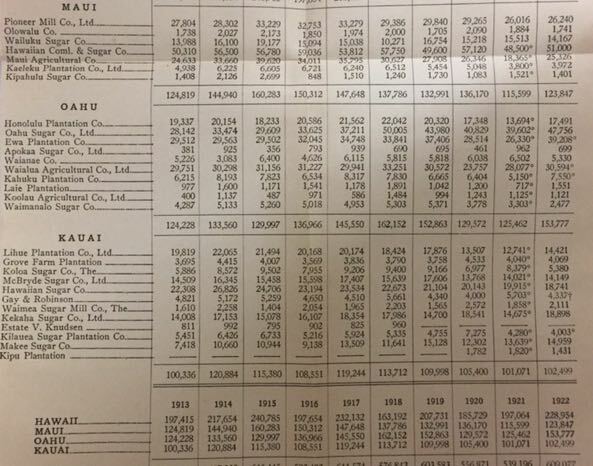 Although there was serious attention to improving yield per acre, success with that would not happen until later decades with better cane varieties and mechanization. Source: C. Brewer records provided courtesy of the Lyman Museum. ​We have started out the new year  with brighter prospects ahead of us than even 1923, for all of which we feel duly thankful. Labor: During the year the labor situation has been very much disturbed but we are pleased to report that, notwithstanding the constant agitation and unrest, our labor as a whole has behaved wonderfully and turned out with reasonable promptness. Because of this attitude on the part of the unskilled employees on Hakalau Plantation it was possible for our plantation operations during the year to be prosecuted with minimum interruption. Around 13,000 Filipino sugar laborers went on strike. During the failed eight-month strike, the picket-line violence killed sixteen workers and four police officers in the "Hanapepe massacre." 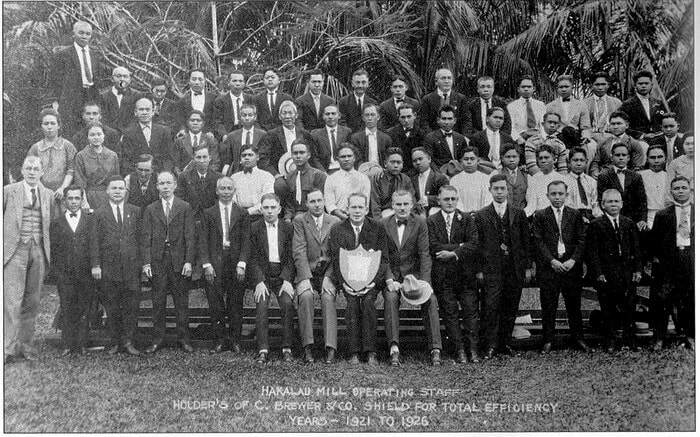 Afterwards, the Territory of Hawaii did not have the money needed to prosecute the strikers, so the HSPA gave money to conduct the court cases. Sixty of the sixty-six strikers received prison sentences, many of them for four years. Afterwards, at Washington, D.C., the plantations lobbied for loosening legal restrictions on immigration. Uncomfortable about the developing relationship between the Japanese and Filipino workers, they wanted to import workers from many countries and prevent worker solidarity. Replacements and Betterments to the Mill and Boiling House:…May I…again bring to your attention the enviable record your factory holds for its efficiency for the past four years? The credit for this record is, first to the operating staff, coupled with loyalty from the operators; then the co-operation from the field staff and the general desire on the part of all to excel. This Company and its management is duly thankful for this spirit of pride in each and every ones’ particular job. Labor: During the year labor was plentiful, quiet and contented. And we are pleased to say that we received good and faithful services from them, and for which we are duly appreciative. Roads, Trails and Bridges: We are now about completing the first section of the new road on Kamaee…This road, when the second section is completed, will be of tremendous advantage to us and will soon pay for itself in lower operating costs of transportation. Reservoirs, pipelines and ditches: We erected a domestic water supply tank of a capacity of 50,000 gallons at Hakalau, replacing the old 70,000 gallon tank which was leaking badly, and which we cut down and rebuilt, using all the good staves. We also had the misfortune of having the spring go dry, which has all these years been supplying the main Hakalau village with its domestic water supply. We, therefore, were forced to lay 8,135 feet of 1-½ inch pipe to another spring that fortunately held out. Our old spring is now back to its normal flow. ​Labor: ​We had sufficient labor throughout the year, and all were very contented and loyal. Flumes and Trestles: This account is, as usual, large. We built 7,000 feet of new flume to facilitate and reduce cost of cane transportation. We rebuilt four flume trestles, averaging 75 feet in height and 260 feet in length, and the usual extensive replacements and repairs. ​Building Improvements: I would like, however, at this time, to compliment the Directors and Stockholders of the Company on the completion of their new office and store. 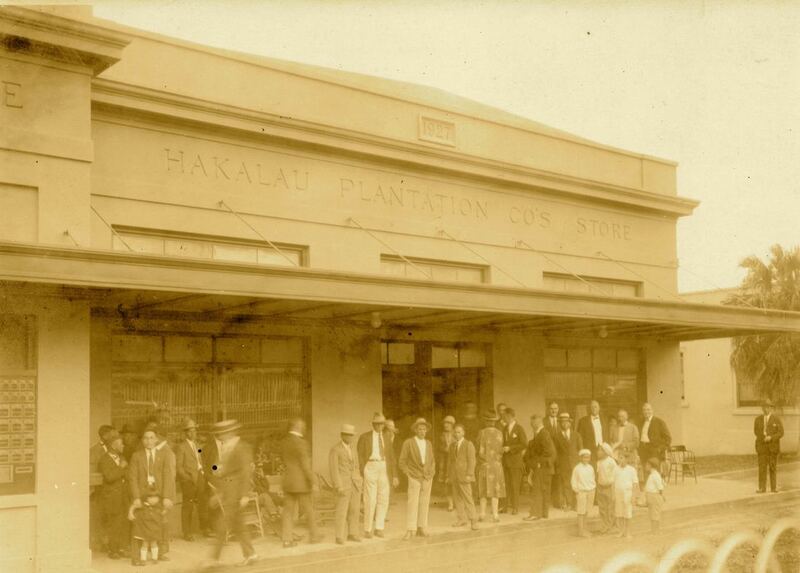 The store was completed on December 27, 1927, and was occupied and formally opened by Director E. Faxon Bishop on January 27, 1928. Both of these buildings make for improved working conditions, and do much to add to the welfare of the plantation employees who are compelled to make use of them. The buildings are also a great credit to the Company and also to the Territory. 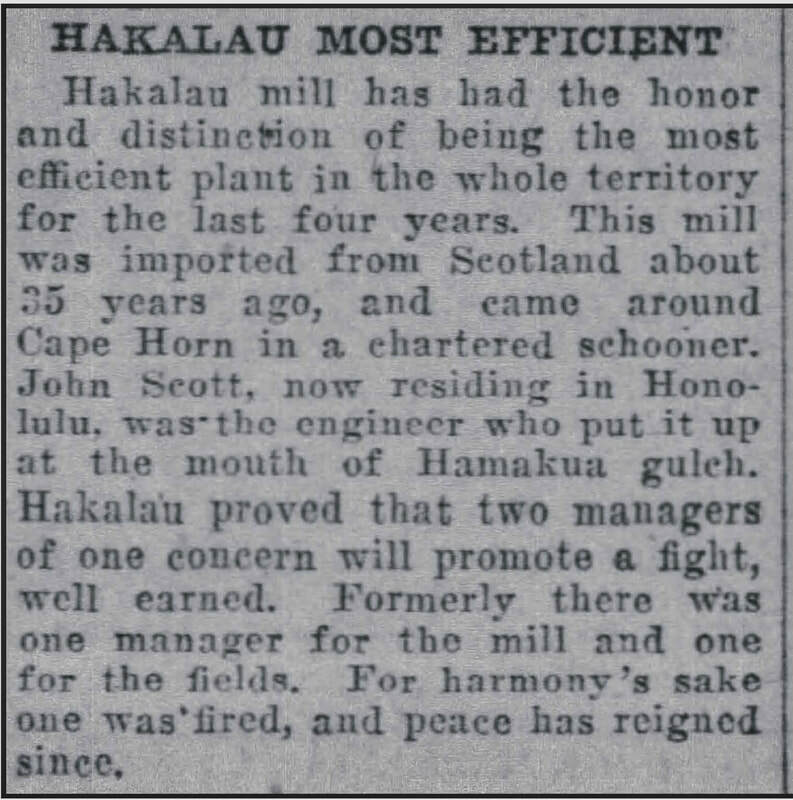 The Hakalau Plantation Company has been highly complimented on these buildings and the spirit of progress which they represent. Labor: ​ Labor was sufficient for our needs throughout the year, and we take this opportunity to thank them for loyal and efficient service. 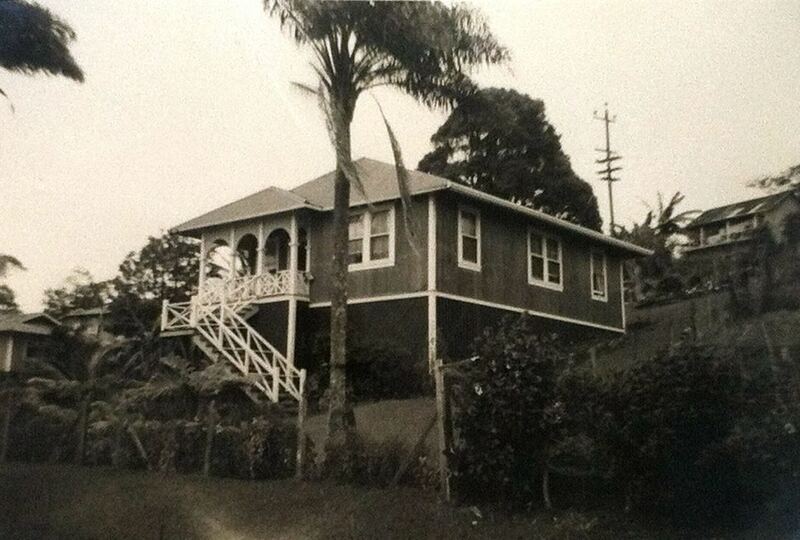 Hakalau Store on the left, the office on the right circa 1927. 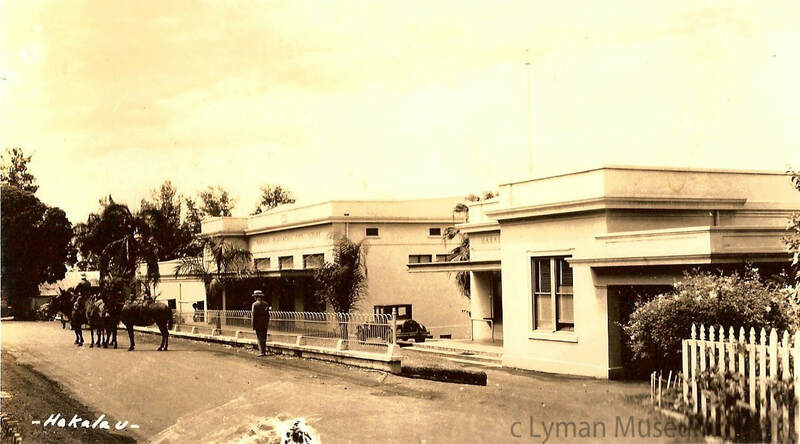 Photo courtesy of the Lyman Museum. 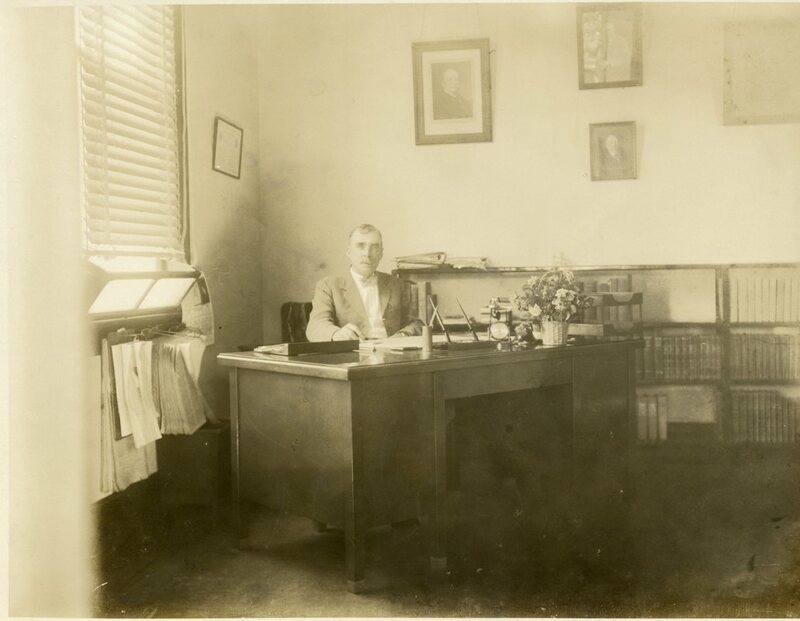 Plantation Manager John M. Ross in his new office. Photo from the Waichi Ouye Collection, courtesy of his family. Mill Staff, along with John M. Ross, displaying the C. Brewer Shield for Total Efficiency Award for the period 1921-1926. Photo from the Waichi Ouye Collection, courtesy of his family. Mill Buildings and Machinery: The buildings, boiling house and engine room were entirely re-roofed, and we also renewed the wall on the north side. This leaves the buildings in excellent state of repair.The principal item of additions to machinery was two sets of Diamond Soot Blowers for our Stirling Boilers, which are proving most satisfactory. The balance was made of replacements, viz: re-shelling mill rollers and crusher rolls, together with replacing all of our high pressure steam lines. ​Plantation Buildings: We overtook all of the work under this head that we reported last year as having fallen down on, so that we kept pace with our yearly building program of new cottages and buildings, together with the usual repairs and upkeep. Labor: We are pleased to report labor abundant throughout the year and we take this opportunity to thank them for loyal and efficient services. Plantation Buildings: We went somewhat easy on this account and only expended about one-half of the amount you authorized. We are getting along nicely with that, viz. : four new three-bedroom cottages, five re-constructed cottages, one community kitchen. ​Labor: We are pleased to report that we had plentiful labor throughout the year; in fact, we had a surplus during the long dry weather of September, October and November. We take this opportunity to thank them for loyal and efficient service.